Lisa Daltirus, our terrific Bess, returns to Seattle Opera--where she's most recently starred as Leonora in Il trovatore, and also as Aida and Tosca--in one of her favorite roles. She talks about playing both Bess and Serena in this opera, about touring with the South African production, and what she loves about Seattle. How many times have you sung the role of Bess? What excites you about singing this opera? I have had the fortune to alternate between Bess and Serena in about 10 productions. I love the extreme differences in these characters and enjoy exploring both. Bess has more development and dimensions to explore, which make it fun to sing and perform. I always look for layers in my characters and nuances of emotion and interaction. I strive to take the audience on a character's journey and show the struggle and heart of Bess. Of course, I love wearing the red dress!! 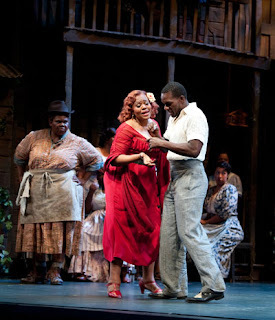 Lisa Daltirus (Bess) and Michael Redding (Crown) in Seattle Opera's current production of Porgy and Bess. Audiences here enjoyed your performance as the fearsome Tosca, and now you’re playing a much gentler (though equally loving) character, Bess. Which of these characters has more in common with you as a person? That's an interesting question as both roles rank among my favorites and I identify with both characters. For me they have similarities in personality. Both are perceived as tough on the outside in the initial introduction. However, we are quickly shown their Achilles heel, their desperation for survival, their drive to fix their situation by any means necessary. I certainly identify with thinking on your feet to solve a challenging problem and being influenced in certain decisions by love. I believe most of us have both fearsome and gentle characteristics in our make up. 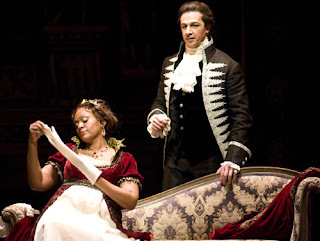 Lisa Daltirus (Tosca) and Greer Grimsley (Scarpia) in Seattle Opera's 2008 production of Tosca. Can you speak about how this opera plays in South Africa, versus how it’s received here in the United States? Have you noticed a different attitude toward Porgy and Bess abroad? I performed a new production of Porgy and Bess with the Capetown Opera in South Africa that toured the UK ...Wales, London and Scotland. The production did not debut on the Capetown stage. But the concept set the drama in Soweto, in the time of apartheid. There were some specific changes and additions to the scenes and spontaneous dialogue that were specific to that culture and time in history. So in fact I don't know first-hand how the traditional Porgy and Bess plays to the audience in Capetown. I was told that the company has staged it for their home audience and it had lukewarm reviews because they didn't really identify with American southern culture of the 1930's. However, when we performed the new concept in the UK it was an overwhelming success. I also understand that the Barkhymer production that tours Europe regularly is very enthusiastically received. 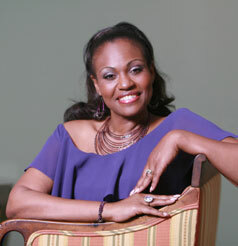 Lisa Daltirus as Aida in Seattle Opera's 2008 production. You’ve starred in several Seattle Opera productions now, and must know the city a bit. Do you have any fun area activities planned for your summer? I absolutely LOVE coming to Seattle and consider it an operatic home. I have also had the good fortune to bring my children for vacation while I have been performing. The city has many fun things to do and we love the distinctive sections and neighborhoods. I love the Seattle Center activities, the Space Needle, and the lakes. I have not enjoyed an Argosy tour yet, and, strangely, have not yet visited Pike Place Market. I plan to change that situation! Otherwise, I will just enjoy revisiting the neighborhoods. I will also savor the low humidity. It is wonderful to have so many renditions available to enjoy by a diverse group of performers. However, due to growing up in a household that had a heavy jazz influence, I love Ella Fitzgerald's "Summertime" and the instrumental arrangements of Miles Davis. You love Ella Fitzgerald's "Summertime"; we Seattleites love YOUR Bess!! I admired it on opening nite and look forward to it tonite, as I just bought a Speight-Jenkins-Standing-Room ticket. Toi, toi, toi!! !